chicken pot chicken pot chicken pot piiiiiiiie!!!! – ugly food tastes better. What else could I possibly do with leftover roast chicken and herb potatoes, and the batch of pate brisee/pie dough I froze the last time I made it? 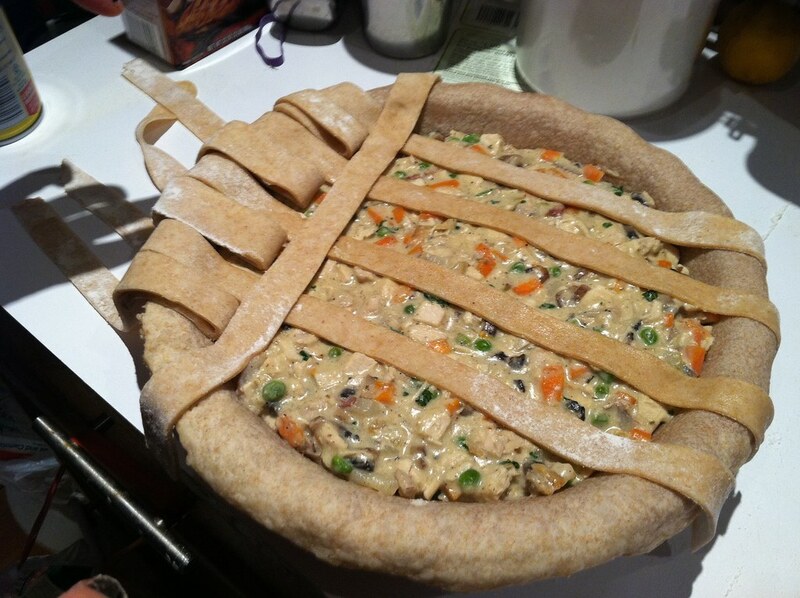 Chicken pot pie, since every now and again, David Cross’ above video gets stuck in my head and I am forced to make it whether I want some or not. I tried to make a healthy version once, and that was dumb. 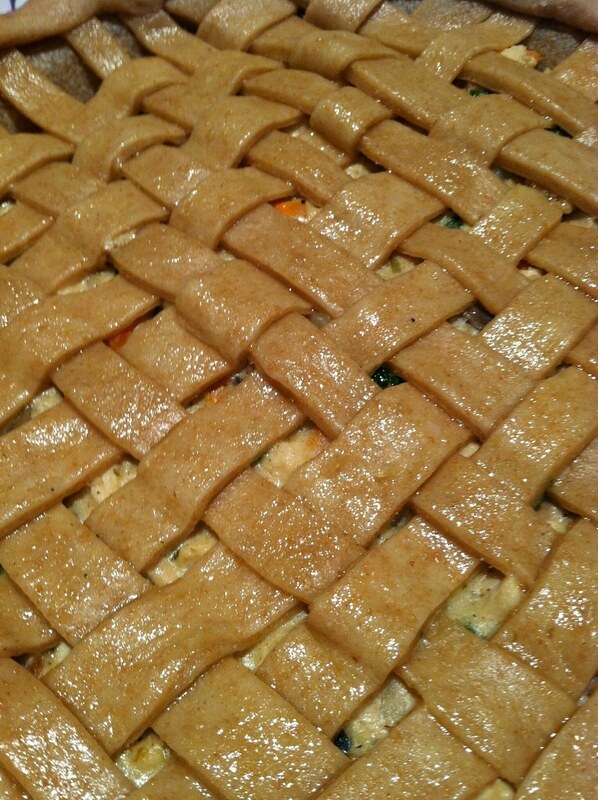 Here is the proper way to do it, as well as a lattice crust tutorial. Start by watching the above video repeatedly. Nutrition – There IS a vegetable or two in every bite, but let’s not kid ourselves. 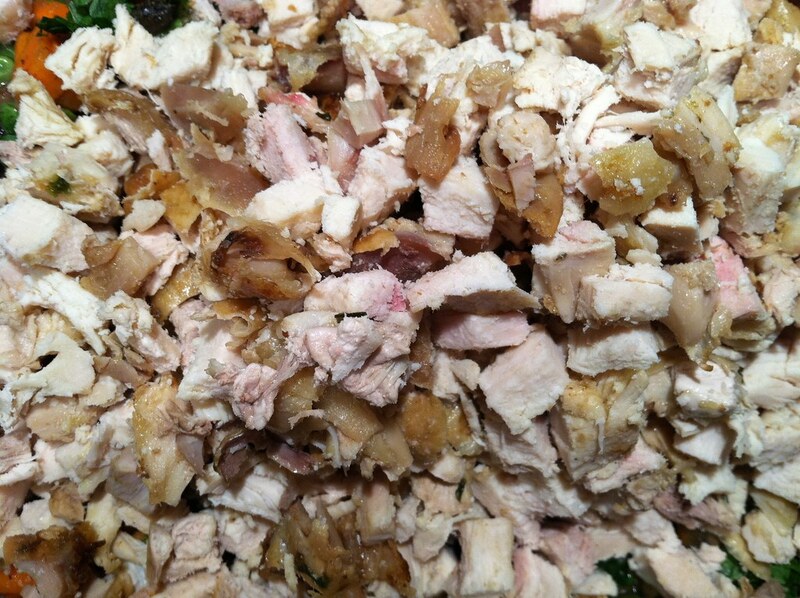 -The remains of my roast chicken, chopped. Probably about 4-5 cups. -I would have used pearl onions as well, but the 5 stores on my walk home were ALL out. 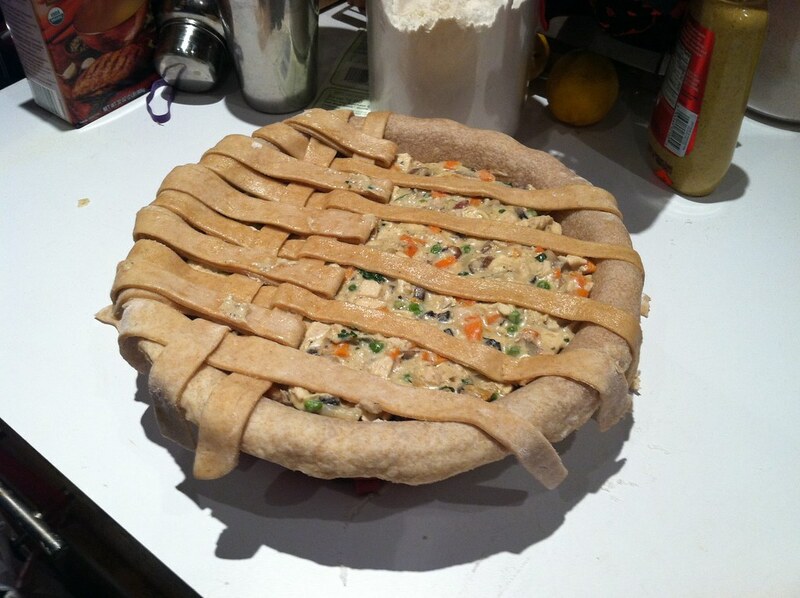 So that didn’t happen, and i do NOT like regular onions in my pot pie. -Optional egg wash = 1 egg mixed with a splash of milk or half and half. With your chopped chicken set aside in a bowl, melt your butter in a large skillet. A lot of people like to make a roux, I like to toss my sliced mushrooms in flour so that the roux kind of makes itself ON the mushrooms, but that’s just a personal preference. All that matters is that your mushrooms, flour, and butter are in the pan. Stir at Medium heat for about 5 minutes and then toss in the rest of your veggies, minus the potatoes, and the garlic and cook until they reach your desired texture. I like mine firm. At this point you can add in your parsley, thyme, and pepper. Now you can add your diced potatoes and chicken. Stir and add the chicken stock and heat to boiling, then reduce and add the half and half and cook while stirring constantly so nothing sticks. 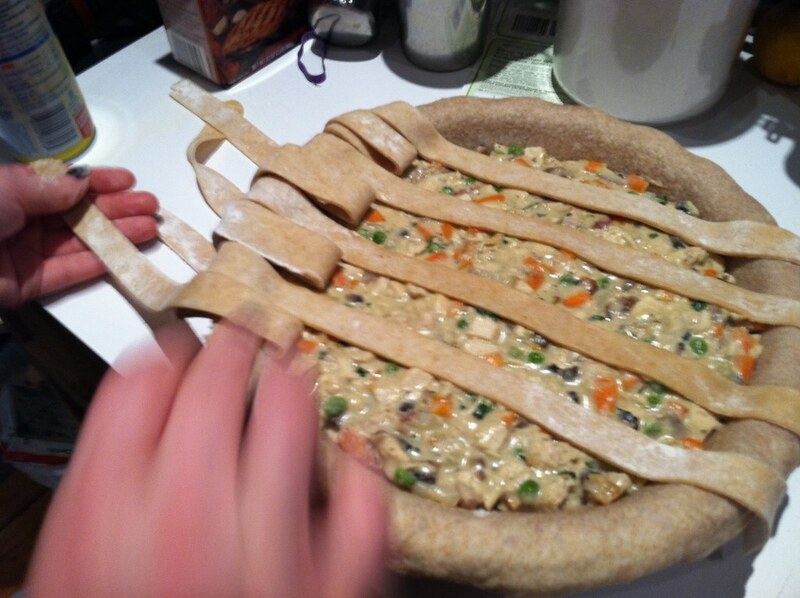 Now, this should be thickening up, if it isn’t, add a little more flour, but don’t go overboard, it takes some time. Then go ahead and turn off the heat on that. Roll out your bottom pie crust now and fit in to your pan. Preheat your oven to 425 and pop it in there while its heating just to get it a little brown. 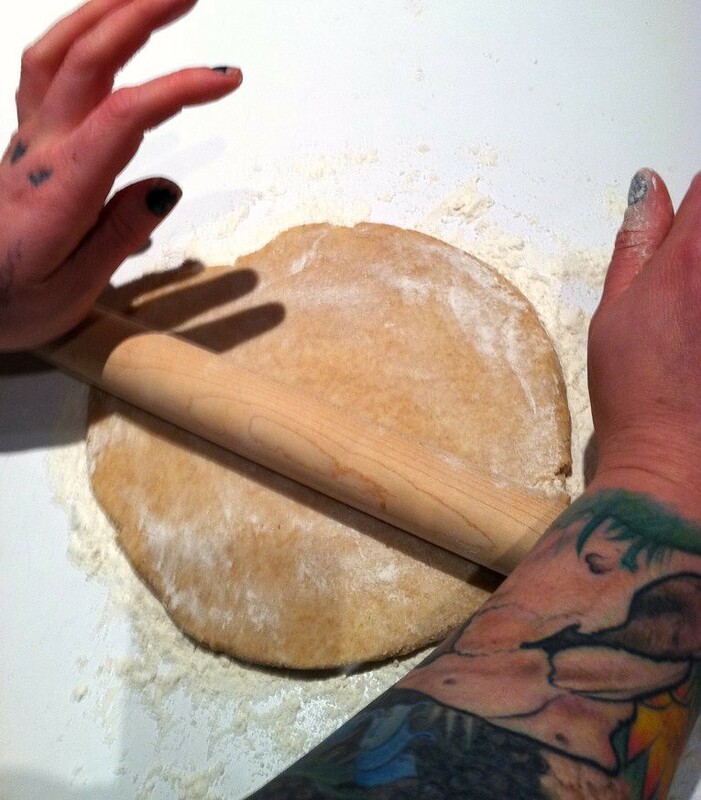 Then you want to fill your pie, and start on your top crust. I decided to try a tighter lattice, and it came out okay, but the filling was hot and started cooking the dough, so work fast!!! 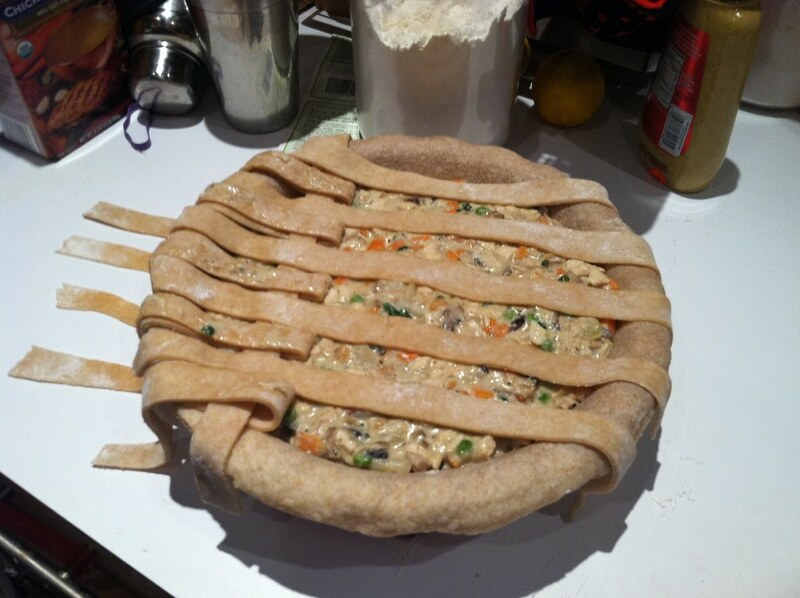 First you want to roll out your dough and cut it in to strips, then lay them down starting like so…with every other strip folded back to the edge. Then lay another strip across. Then alternately pull up the strips that are under the piece you just laid down, and pull down the remaining strips over it, but no farther. 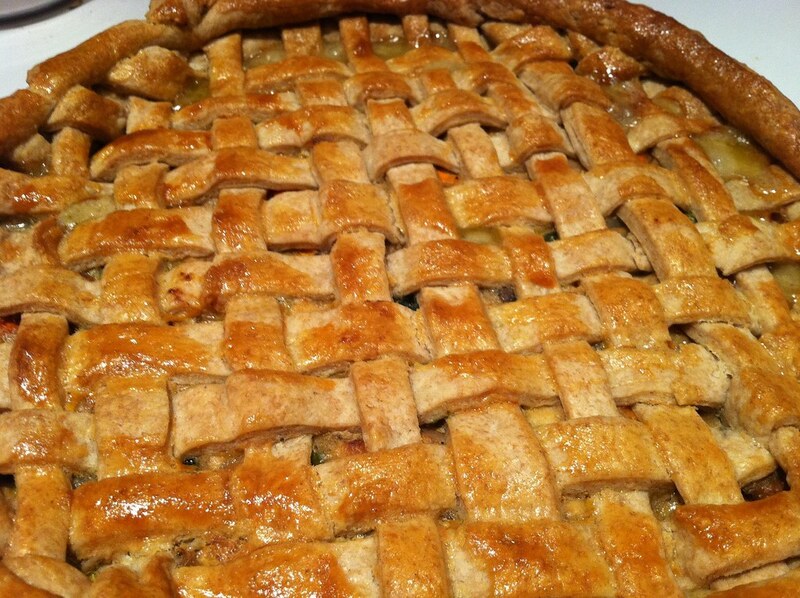 until you have a finished lattice crust! Then roll out the leftovers and circle around the perimeter so that everything is neat and pretty, and if you desire, brush with egg wash.
Then bake at 425 for 25-30 minutes and let rest a painstaking 15 minutes before digging in. It was so good. I really wish there was a healthy way to make it. 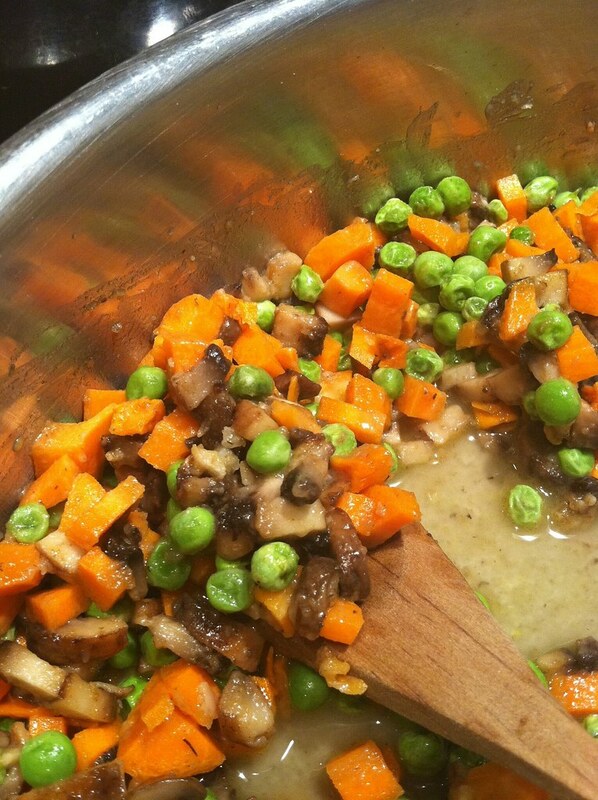 Every healthy version I try ends up being pot pie soup. 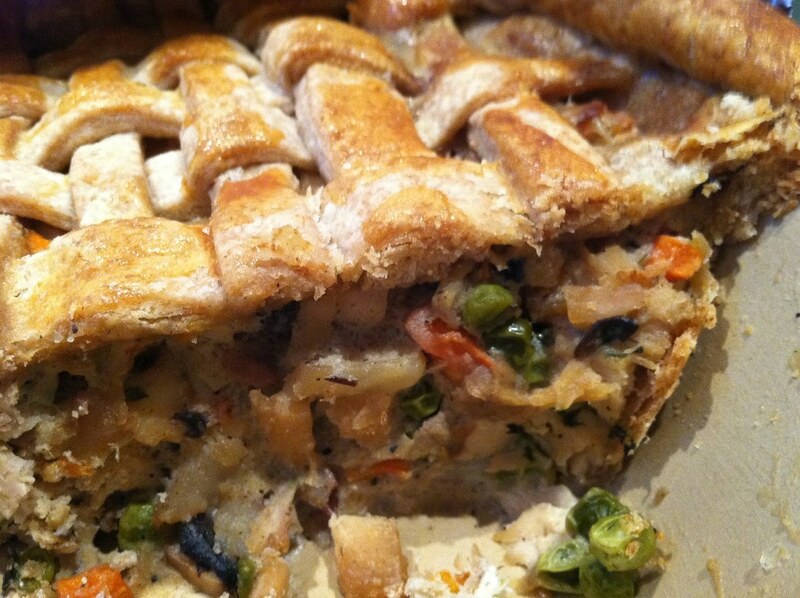 Once you take away a flaky buttery crust and the cream, how can it be a pot pie! ?